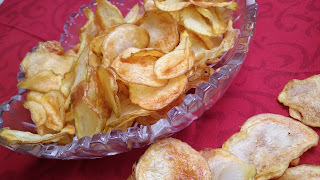 Another interesting oil free snack recipe made at home in airfryer. 1. Wash all potatoes very nicely to remove all dirt as we will keep the peels of potato and will not remove it. 2. Using a potato slicer, make nice even slices of potato. Soak all potato slices in a bowl of water mixed with vinegar. Soak potato slices in water for 15-20 min to remove starch. 3. Then drain out the water from the chips and wash in fresh water. 4. In another pan, take fresh water, mix little salt as desired. Add potato slices in this water and boil it on medium flame for 2-3 min to remove any further starch. Do not over boil the potatoes. 5. Once boiled, wash the potatoes in cold water in a mesh and allow the water to drain away completely. 6. Spread the potato slices on cotton or muslin cloth and allow it to dry for at atleast 20- 25 min. 7. Preheat airfryer at 180 degrees. Meanwhile in a bowl, take all potato slices and coat with little oil using hands. 8. Transfer the potato slices in airfryer basket and cover with the lid or foil paper. 9. Keep the potato slices in airfryer at 200 degrees for 25 min. Keep moving the potato basket in between to prevent sticking to each other. 10. Once done, cool the potato chips and store in airtight container. Sprinkle little salt, if required. Had my airfryer for years and this is the FIRST chip recipe that worked - thanks!